A NEW and progressive £1.5 million maternity unit opened at St Peter’s Hospital on Bank Holiday Monday. The state-of-the-art Abbey Birth Centre – appropriately abbreviated to ABC – opened its doors to mums-to-be on the International Day of the Midwife. Led by a group of fully trained midwives, as opposed to doctors, the NHS facility is unique to the area. 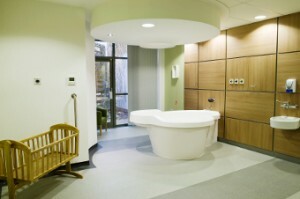 The avant-garde ward in Chertsey offers an ideal ‘home from home’ setting for women seeking a natural and positive birth experience. The pioneering centre is very different from a traditional labour ward, being run by a team of midwives who are passionate about promoting and supporting natural childbirth whenever possible. Situated next to the existing Abbey Wing maternity unit at the Guildford Road hospital, the Abbey Birth Centre has been purpose built to provide a homely and relaxing environment. For women who have normal, uncomplicated pregnancies and want to give birth in a less clinical setting, there are four en-suite birthing rooms, three of which have birthing-pool facilities. There are also extra touches such as iPod stations and a small outside garden space. St Peter’s now has the widest range of maternity services in the area – from a natural birth centre to high-risk maternity services, including a Level 3 neonatal intensive care unit. And new last year is a special care unit on the postnatal ward, so mums can stay in hospital if their baby requires additional neonatal care. The trust’s Associate Director of Midwifery, Jane Urben, said: “Everyone is really enthusiastic about the unit. We are so pleased to be able to offer this amazing facility and promote natural birth in a non-clinical environment.